On a clear summer day in 1996, Massachusetts Gov. William Weld (R) signed the Rivers Protection Act, an aggressive environmental policy that put a development buffer around the state's rivers and creeks. "For each new development anywhere along our riverbanks, this bill requires proof that the project will not harm the environment and that no feasible alternative exists," he said, standing in Boston next to the Charles River, which was improving from decades of industrial pollution but which still had a brown tint. Weld, fully clothed, then celebrated by diving into the river behind him, followed shortly by state Sen. Robert Durand (D), who wrote the bill and shepherded it through the state Legislature as a key committee chairman. "It actually surprised me that he went in, so I went in after him," Durand, who has since retired from elective office, recalled during a recent interview with E&E News. This week, Weld took another dive, making official his long-shot candidacy in the 2020 presidential election as the only Republican challenging President Trump in the primary. His swim in the Charles lives on as an example of his showmanship, a key quality if Weld hopes to have a chance against Trump, a real estate mogul and former reality television star. But people who worked with Weld say diving into the river was also a sign of how seriously he takes environmental policies. The former governor would be far more liberal than Trump on policies surrounding climate change, the environment and energy. Weld has endorsed keeping the United States in the Paris Agreement, spoke last year of the "pressing need to act on climate change," is an outspoken critic of Trump's environmental policies, and favors increasing renewable energy and nuclear power. "Bill Weld's a great environmentalist," said Durand, who has been a close friend to Weld since they swam in the Charles, including frequent hunting and fishing trips together in New York and elsewhere. Durand is also supporting Weld's campaign and went with him to New Hampshire this week to stump with voters. "Trump thinks that humans should rule the world. 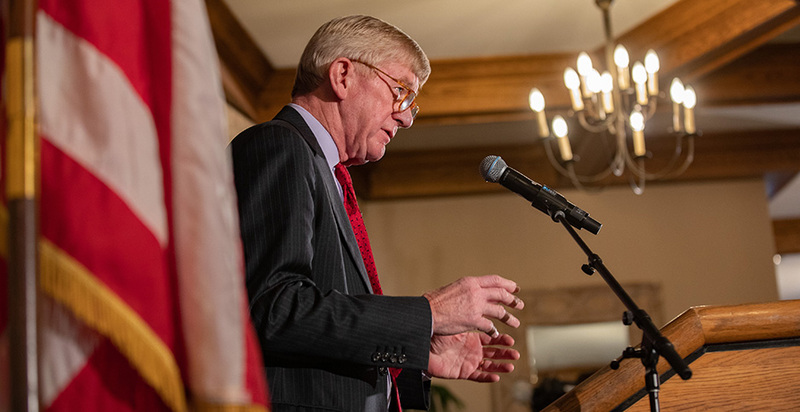 I think Bill Weld understands the ecology and fragile nature of our ecosystem and is a supporter of protecting that ecosystem, because it also means the protection of humankind," he said. Jack Clarke, director of government relations for the Massachusetts Audubon Society, also had positive words for Weld on his record and his plans for the White House. Clarke was the top environmental official in Weld's administration overseeing coastal zone management. "He is a Teddy Roosevelt, old New England Republican type of politician, with a view that conservation is an inherent value for the state and certainly for the country," Clarke told E&E News. "I think he would be very good on the environment," Clarke said of a potential Weld White House. "We would look to a Weld administration to make the top appointments as people who are not coal and oil lobbyists, people who care about public health and the environment." The fisher cat, a weasel species native to New England that's often considered a tenacious pest that harms other animals, has become an unofficial mascot of the campaign. "People are usually like, 'What is a fisher cat?' But [they] don't realize how ferocious they can be, sort of like me and this campaign," Weld said in New Hampshire this week, according to The Boston Globe. He later tweeted a drawing of a fisher cat with his campaign logo. Weld served as governor from 1991 to 1997. In promoting his 2020 campaign, Weld highlights his accomplishments cutting spending and taxes in the Bay State, which often gets the moniker "Taxachusetts." But he also had a number of major environmental accomplishments, including the legislation protecting areas near waterways. Weld helped protect more than 100,000 acres of open space, largely through a bond measure he pushed that enabled the state to acquire the space and set it aside to protect important assets, including wildlife, as well as other purposes. He spearheaded efforts to protect endangered and threatened species such as the piping plover and worked to update septic codes to protect water. "Bill Weld was probably one of the best environmental governors this country has ever had," said Durand. Durand went on to lead the Massachusetts Department of Environmental Protection under Weld's Republican successors, Paul Cellucci and Jane Swift. Weld previously served as an attorney in the Senate's investigation of the Watergate scandal. Later he worked as an attorney at the Justice Department, where at one point he was responsible for supervising Robert Mueller, the future FBI director and special counsel who investigated alleged ties between Russian interference in the 2016 election and the Trump campaign. Weld resigned as governor in anticipation of becoming ambassador to Mexico under President Clinton, a Democrat. But Weld's confirmation was blocked by GOP Sen. Jesse Helms of North Carolina, who chaired the Foreign Relations Committee and disliked Weld's support for liberal policies like medical marijuana and abortion and LGBT rights. Since then, Weld has been in private practice as an attorney. He was the Libertarian Party's vice presidential candidate in the 2016 election, alongside presidential candidate Gary Johnson. He ran for governor of New York in 2006 but lost the Republican nomination to John Faso, who went on to lose in the general election to Eliot Spitzer. Weld has brought up climate numerous times in public appearances since launching his 2020 campaign. "The president insists that global warming is a hoax. Well, does he think the scientists who did those measurements are making money off the deal and lying about the results of the scientific examination? It just betrays a lack of homework and not really thinking ahead about what to do," he said on MSNBC's "Morning Joe" this week. "We're going to have the White Mountains with no snow. ... The oceans are going to rise. We're going to have all our seacoasts rearranged when that polar ice cap melts if nobody does anything about this." In a February speech, Weld said the United States "must rejoin the Paris climate accords and adopt targets consonant with those of other industrialized nations." Weld has said his strategy against Trump focuses on what he sees as the areas least receptive to him, including New England, the Mid-Atlantic and the West Coast. He's noted that 20 states allow independent voters to vote in either party's nominations, and he's trying to convince them to vote for him. He's also targeting younger voters including millennials and Generation X, who as a group are more concerned about climate change than their older counterparts. In recent history, presidents who have faced primary challengers have consistently won their primaries but lost in general elections. To be sure, Weld faces a steep uphill battle in the election. A Gallup Poll this month found that 89% of Republicans back Trump, a number that has stayed consistent through his tenure. Trump's supporters don't seem worried. "He's not even a Republican," argued Mike McKenna, an energy lobbyist who briefly served in 2016 as the head of Trump's transition team for the Department of Energy. "It'll be fun to have him in the race. He's a bit of an old-school-type guy," McKenna said. "Kind of like [Mitt] Romney, but with less starch."